The fabric art jacket in the photo at right was made in 1991. I have always loved everything related to Disneyland and DisneyWorld. When I was growing up, my mother was a free-lance artist for Walt Disney, and she did all of the artwork for two Disney board games: Fantasyland, and Steps to Toyland. Particularly when she was working on the Fantasyland game, we would go to Disney animated features repeatedly, while my mother sketched ideas. I was dazzled. It was wonderful! When I grew up and married, we lived in Florida for about three years. While there, we visited DisneyWorld about every two weeks and never grew tired of it. In fact, it’s still one of our favorite vacation spots. 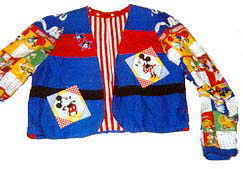 Late in the 1980’s, I started collecting Disney fabrics for a “someday” wearable art project. This is the jacket that I made with those fabrics, around 1991. The sleeves are a Disney calendar fabric, from a year when New Year’s Day was a Friday. The stars with Mickey in the center are actually from a fabric with a yellow background, so I carefully cut out the stars for this project. The larger Mickey and Minnie, and their counterparts on the back of the jacket, are all from a panel-type fabric that made a Disney tote bag. The back of the jacket is trapunto, with Mickey and Minnie in relief. Most of the fabrics are cotton blends, and I machine pieced them. The appliques were applied by hand, sometimes tacked in place with fusing. The lining is a 100% cotton fabric in red and white stripes, not a Disney fabric. I think that I used a Simplicity pattern for the general design of this raglan-sleeved jacket. It has a thin woven-type quilt batting as an interlining in the bodice only (not in the sleeves), for warmth. It became one of my favorite jackets. Today, it’s displayed far more than it’s worn. To create a similar jacket yourself, choose a very simple clothing pattern. Look in the “easy to sew” section of the pattern books. Choose something that can be made in an hour or two. Then, you can focus on your piecing and embellishments.